The 4th and final figure I’ve got from these sets is the Cyberman from “The Tomb of the Cybermen”. This Cyberman figure is a rare occurrence where the figure looks better than its source material. The figure is well sculpted and I love the details on the figure. The tubing running down the arms and legs would have looked flat and boring had it just been sculpted on. Bravo to Character Options / Underground Toys for going the extra step. Unfortunately, the tubing restricts the available articulation, but it is just a small nit on an otherwise great figure. 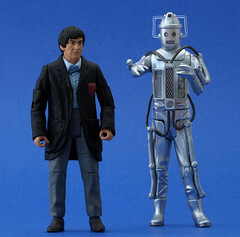 I am left wondering when Cybermen first appeared with 5 fingers on a hand vs. the three pronged hand this fellow sports. See a second picture after the jump.